Recent security hiccups aside, Snapchat is almost universally well-liked by its users. So will they tolerate a few ads here and there? 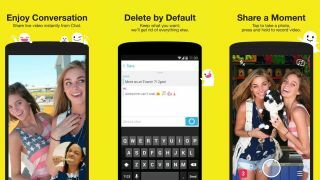 Beginning this weekend, a single video ad will appear in the Snapchat app's "recent updates" section. "It's going to feel a little weird at first, but we're taking the plunge," reads a Snapchat blog post about the move. The ads won't be tailored to individuals, but users will be able to choose whether or not to watch them. They'll disappear once viewed, or within 24 hours if they're simply ignored. This move only applies to the US for now, but if users don't complain too much it Snapchat will no doubt expand its ads to other countries. Given the fleeting messaging app's popularity worldwide, they'd have to be crazy not to. However ads won't appear in your snaps or your chats, because "that would be totally rude," the blog post reads. "We want to see if we can deliver an experience that's fun and informative, the way ads used to be, before they got creepy and targeted," it says. They certainly have a point, so let's hope this works out.